My name is Kōdō Nenshō Suisen. I like a lot of things, I dislike only a few things. My hobbies are working and cooking. My parents have been gone since I was little. I never had siblings. My friends are very kind to me, but other people think their all jerks. I'm sixteen years old, I have my learners license. I work a part-time job at a fancy restaurant called 'Bi Ikinimu', which translates to beauty Ikinimu. But Ikinimu is a traditional of Iukinim, and when you which around its minikui which means ugly. Don't know why, but at least I get good payment. So it doesn't really matter. I'm in high school, I'm also the student counsel president. I have my own club called the 'cooking club'. I love cooking. I think it was thanks to my father, he was chief of the very restaurant I work part-time. I also in another club as well, the 'manga making club'. Or short the M.M club. It's wasn't my idea, but I do it anyways. I live in a small apartment, nice and simple. I wish my life can stay simple, but God has other plans. "Kōdō! Hello~ earth to Kōdō. Hey!" "*Groan* sorry, what did you say?" "Come on Suisen, be more serious! We need a plan of attack here. We are literally desperate for ideas! How are you so calm at we are in the state of terror?! This is terrible! Absolutely terrible!" "Chill out Iya. It's just manga. Whatever the story plot we make it won't matter at the end. Besides, it's not like anyone but us is going read it." "You don't get it! I want this manga great, so great that my children will pass it down to generation to generation to come." "When you put it that way it's sounds more idiotoic then it was already was." "What?! Suisen, why are you so mean?!" In case your wondering this 'guy' is Kanari Iya. He is a boy, but he looks a lot like girl. A pretty girl. We been friends since we were kindergarten so I always see him as my little brother, or sister. It was because of him is why I join his club in the M.M club in the first place. But what can I really do. He always asks me to help all the time and this club was one of them. Iya isn't the most athletic person. But he is no coward. He can be clumsy at times. He is very sweet to others. Knowing he is a boy who wears girl clothes, it never bother his older brother. Not one bit. Don't about his parents because I never meant them, but Iya says his parents very caring and powerful? "Hey! Miss Kōdō, there's a fight in the hallway!" "Yes, again! It's Kaoro & Jisu!" "Jisu? How did a guy like him, got himself into a fight Kaoro Okkemiji?" "I literally have no idea. The people say that Jisu said something insulting to Kaoro or something." "*Sighed* fine~ I'll deal with it. Sorry Iya, I'll help you later. I promise." "*Sighed* never mind, I'll tell you when you come back. Be careful, okay?" "Ma'am President! Come on! We don't have the time for this!" This person is Oshiageru Rūru. 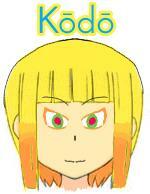 Rūru is a guy most people call bossy and a total pushover, but he is also kind and friendly. Even though everyone won't believe it. But if mess with his glasses, you will never hear the end of it. He is my right hand man and he always tells me what is new or popular. "*Clap 2×* Alright, alright! That's enough! Back away now! Fight is over *Clap 2×*"
"Awww, no fair... why should we?" "Don't ask me, you can tell that to the principal if you want. I'm sure he will just love to know. Hmm~"
"Uh... no thanks. I think I'll just leave." "*Sighed* finally, what a pain. Hey! Jisu, are you alright? You have so many injuries. What happened?" He says nothing, just pointed at Kaoro Okkemiji. "Kaoro Okkemiji! What did you do to poor Jisu!" "What!? Why are you blaming me?---"
"Oh~ Hell No! Don't you dare even go there meister! I know you Kaoro, and I know you lie! Not just that, you are the cause of fifty-two percent of the students fights!" This Kaoro Okkemiji, an blundering idiot. He is also one of my childhood friends. Ever since we first meet, he only gets himself in trouble. Like what I said, he lies. Quite a lot actually. He always, always pick fights with anyone who happened to piss him off. So how did Jisu made Okkemiji mad. "I... I... I'm very sorry! Please forgive, Kaoro." "That better be an apology your going to say, Okkemiji." "Jess~ fine. I am... sorry as well. JustDon'tTalkToMeAgain." Now this guy. Yōsei Jisu is the most kind and sweetest person you'll ever meet. He might look like delinquent, but he is more like that a crybaby. He is super shy, and very into freaky things for some reason. His father was delinquent but his mother was a total... air head. What do get when you combine those two together, you get Yōsei Jisu! "Come on you two, let's go to the infirmary. You guys look absolutely awful." After I sent them to the infirmary, I walk back to the club room. "Hey! I'm back. Sorry it took so long." When I walked in I immediately got hugged by Iya. "What? Did something happen while I was gone? Iya?" "No surprise, no shock? Come on, you could at least change you expression a little." "So that what's about. Then no." "Just because your boy, doesn't mean I'm just going to freak out about. Mostly because your appearance is related to girl." "That your hugging me a bit too long. Because I totally agree." "No! Not that! It's the fact you can be too honest." "Too honest. Tell me something I don't know." That's my daily life. Work, eat and sleep. But it all changed after that day, when the storm came. It was in the middle of March, I was running home. My boss called, telling me that they had to close early cause of the storm. I forgot my umbrella so I check if there was any shelter nearby. I couldn't find anything to hide under, so I just kept running. Before I knew it, I got hit by lightning. Everything was just blank after that, not surprising. Who can remember anything after getting hit by lightning? That aside, I wake up on hard cold ground. I heard police sirens and people gossip. I feel a tingling sensation through out my body, like if there was bolt of electricity jumping in my bloodstream. I slowly started moving, then I wobbly lifted myself up. I heard screaming. I scanned my surrounding, but everything looked fuzzy. As my eyes adjusted, I saw police tape and police cars. There was a crowd of people too. In that crowd, I think I saw... Iya? Yep, that's Iya. What happened? I remembered that I hit by lightning. But how is that possible? I should be dead. Oh... now I know why they screaming. "Miss! Are you alright?! Can you hear---"
Why is he so loud? Just because I got hit by lightning, doesn't mean I'm deaf. Thought in mind, I cover his mouth with my hand. "I'm fine. But I don't think I can walk. Just please stop yelling." "Oh... sorry miss. We need a medic!" Again with the yelling. Ugh~ I feel my head hammering. Before even noticing, I found myself being carried by Jisu!? "*Goran* When did you get here, Jisu?" "I was waiting in the crowd, then when Iya said your name. I... I... I just couldn't stand by and do nothing. Not if my friend is needing an aid of need." "*Giggled* Your so sweet, it could be criminal. For guy who doesn't watch any romance movies or read romantic novels, you really act like a prince from a fairy tale." He didn't replied, then I saw his face. Poor thing was blushing like a tomato. After I was transported to the hospital, apparently I was fine. The lightning didn't do anything meager harm. But I still couldn't walk until an entire week! And I couldn't leave the hospital until I was fully healed, it felt like torture!!! After a week has passed, I come to school. I'm apparently the new gossip around here. Everyone asked me a lot questions, some would whisper behind my back, and some would spread rumors about me 'The Caller Of Lightning' or something. I didn't really care about that. All I care about is about my homework and all of my other duties of being student counsel president. "Hey Kōdō, your talking to yourself again." "Hmm~ I'm sorry Jisu. That's real bad habit of mine, huh?" "N-no it's okay! I actually find it quite cute. I... I... I'm so sorry I have to go! Bye!!!" And just like that, he's gone without a trace. "It could be me, but did Jisu ran away faster than usual." After the day was over, I finally made it home earlier today. My boss free me earlier cause he heard about my indent from the hospital. I open the door of my apartment, and immediately got attacked. I dodged and then pinned the person who dare to attack me in my own home, to the floor. This happened before, but like this. "Who are you? What business do you have here? Why are you in my home?!" "Wait... this is your home? But that means your..."
Is this person stupid or what? After they said that, I hear two pair of foot steps running towards us. "Hey! What happened?! Are you---"
Everything went silence when I saw... myself!? I look at the person I pinned, she is me too! "YOUR ME!? WHAT THE HELL IS GOING ON HERE?!"